Many times you have stated that condominium management has to be able to enter units. In other words, they cannot be locked out. What are my rights as an owner when I have been robbed five times since 1980 and other residents have reported theft as well? The police and management have blamed these incidents on guests of family members. I live alone and never provide my key to anyone. Our board of directors has access to keys from all the other units. My Ohio attorney states that this is illegal in other states and only one person can have access to the keys. What does Florida law state? What are my rights if I get robbed again? RIGHT OF ACCESS TO UNITS.—The association has the irrevocable right of access to each unit during reasonable hours, when necessary for the maintenance, repair, or replacement of any common elements or of any portion of a unit to be maintained by the association pursuant to the declaration or as necessary to prevent damage to the common elements or to a unit or units. As you notice in this section, management is not included in this section of the statutes. However, if the board of directors instructs the manager to inspect apartments, he is doing so with instructions from the board. Some condominiums require the unit owners to provide a key in the event that they need to access the unit for repairs or inspections. There are procedures to secure entry when owners are not at home. In some situations when entry is required, the owners are not available, and no key is provided, the board of directors can force entry into the unit. Obviously, there needs to be some type of communication or attempt to communicate with the owner before entering the unit. Each state has its own laws and the out-of-state attorney without knowledge of the Florida Condominium Act cannot advise you as to the proper procedures you are questioning. After an annual election for a new board of directors, can they assume responsibility and enact their powers without going through a swearing-in process? Is a swearing-in the legal requirement for the newly-elected board of directors, or can they assume their director’s duties from the moment the election results are announced, the previous board is immediately dissolved, and the newly elected members are in control? ANormally, at the completion of the annual meeting, the new board would call to order an organizational board meeting. That meeting should have an agenda with two items: the election of the new officers and the scheduling of the next regular board meeting. There is no legal requirement for swearing-in the new board. Some associations require a swearing-in process, but it is not needed. There is no regular process or procedure for this organizational meeting. I would suggest the outgoing president, the manager, or an outgoing director or officer call the organizational board meeting to order and proceed with the election of the new officers. Once a new president is elected, the meeting could be turned over to the new president to chair the meeting or have the manager continue the meeting agenda. This meeting would be conducted as any other board meeting, and once the two agenda items are completed, the meeting should be adjourned. As a side note, the election of the officers is the only time a vote can be a secret vote. Can a husband and wife hold the offices of president and treasurer on our board of officers? Is that not a conflict of interest/collusion? No one else wants to volunteer to run for an office. Apathy! I recall something from Tallahassee years ago stating that it is not allowed. AThe Condominium Act restricts two members from the same unit serving on the board at the same time. The Homeowners Association (HOA) Act does not have this restriction. You are right; it is a very risky situation. Until your owners understand that they have the need, the right, and the responsibility to serve the association, they are allowing too much power to one family. The un-fortunate matter can result in the loss of value to the homes in your community. It also can cause an increase in your fees. Our condominium is a large association with a budget of more than $800,000. Currently, we do not have a CAM but a salaried “office manager” who runs the association. He claims that he can call himself an “office manager” and does not need a CAM license. He has taken the CAM course and the test twice but failed. Is he correct in his claim that as long as he calls himself “office manager” and not “association manager” that he can run the association without a CAM license? AThe statute that covers condominium and homeowner association management is FS 468.432. It reads that no person shall manage or hold themselves out to the public as being able to manage a community association unless they hold a CAM license. This law also defines a community that would fall under this law and the duties the manager performs. An association means a residential homeowners’ association in which membership is a condition of ownership of a unit in a planned unit development; or of a lot for a home or a mobile home; or of a townhouse, villa, condominium, cooperative, or other residential unit, which is part of a residential development, which is authorized to impose a fee, which may become a lien on the parcel. Just because he calls himself an office manager does not exempt him from the requirement to be licensed as a CAM. Association management means any of the following practices requiring substantial, specialized knowledge, judgment, and managerial skill when done for remuneration and when the association or associations served contain more than 10 units or have an annual budget or budgets in excess of $100,000. If he controls or disburses funds of a community association, if he prepares budgets or other financial documents for a community association, or assists in the noticing or conducting of community association meetings, and coordinating maintenance for the residential development and other day-to-day services involved with the operation of a community association, then he is performing association management. Why would your board hire a person who has failed to qualify twice? If a complaint is made to the state, your association, as well as this person, can be fined. Your board needs to rethink hiring this unlicensed person. We have a homeowner in our community who had not paid an HOA fee for eight years. Finally, the board hired an attorney who placed a lien on the home and the bank foreclosed. What we just learned, when we asked why this family was still living here, we were told they had made arrangements to pay the bank directly. Is this legal? They still have not made one HOA payment. AI am not the person to answer this question; you must consult with an association attorney and take the appropriative action recommended by the attorney. I will comment on the neglect of the members and the board. Your boards have been terribly negligent and failed to comply with their responsibilities to manage the association. The good thing is that they have contacted an attorney. The attorney should be able to advise you if you can still collect the delinquent fees. The agreement between the bank and this delinquent owner has nothing to do with the associations claim of late fees unless it went into full foreclosure. If the boards failed for eight years to attempt collection, you have an association with serious problems. Every member in your association needs to read the association documents and review the statutes. My guess is that past boards have really never managed the association properly, and you probably have other major discrepancies. Properly-operated communities maintain or improve their property values. Improperly-operated communities will cost the owners lower property values and higher expenses and thus higher fees. There is no state agency to turn to when the members themselves fail to elect good directors. No state agency can help when owners do not verify decisions made by the board. The owners are totally responsible for the actions of the board and any cost will be paid by each owner. The members’ apathy is the main reason for this failure. I have always said that sometimes you need to hit them with a two by four in their pockets. As we begin the New Year, I have retired from writing this column. With this final column, I would like to leave you with one last thought. This column has been written for more than 35 years. Jack Holeman and I have devoted many hours receiving your questions and attempting to provide answers. Over the 35 years, I estimate that we received almost 800,000 questions. 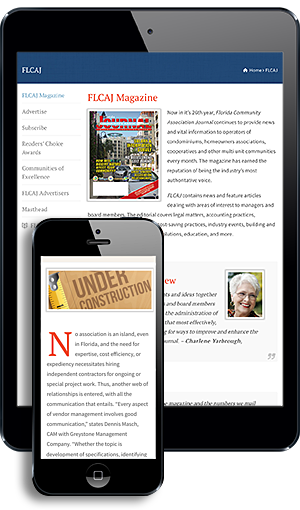 The column was published in many Florida newspapers and national, professional magazines. It was a place where the readers could ask ques-tions and receive answers to guide them to a working solution. I want to thank the publishers and editors for their support in publishing the column and the readers who found the information valuable. Someone once asked me to provide a list of the most important questions. As I close out this column, my last answer is what I consider the most important question asked by the readers. That question involves “apathy.” Over the years, I have seen that 80 percent of the people could care less, five percent are agitators, and 10 percent workers. The extra five percent is the unknown factor. The issue of apathy is a national problem. There is too much thinking of letting the other person do the work or make the decisions. To me, apathy is a failure of accepting responsibility. Admiral Hyman Rickover, the father of our modern submarines, said, “Responsibility is a unique concept. You may share it with others, but your portion is not diminished. You may delegate it, but it is still with you. If responsibility is rightfully yours, no evasion, or ignorance, or passing the blame can shift the burden to someone else.” Applying this to condominium and homeowner associations, every owner is responsible for their actions and the actions of the board of directors and officers. Bottom line, you as owners are responsible if your association fails or thrives! There is no excuse to blame someone else when events happen, resulting in failure. In order to protect yourself and your association, read the documents, know the statutes, keep current on actions taken by the board, and volunteer to serve. Responsibility cannot be given to another person, and any errors or mistakes made by the board of directors or the officers will fall back on the members in increased expenses or decreased property values. Every action taken can devalue or improve your property. You are still responsible to pay for the costs for mistakes or profit from the improvements. It is your pocket because you are the final person responsible. The “buck” stops with you. Apathy should not be in your vocabulary. Members need to share in the decision process.